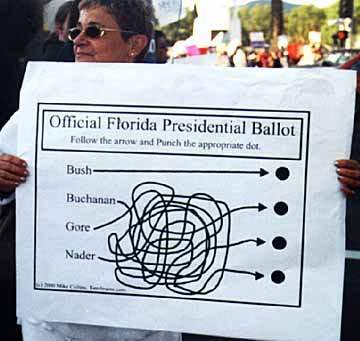 Stolen votes and missing ballots... Jeb Bush's version of the chant, "This is what Democracy looks like!" This Pro Democracy demonstrator at the Westwood Federal Building in Los Angeles holds a protest sign that is a parody of the Official Florida Ballot. At this critical time, all Americans should join the growing national demonstrations to defend democracy. The ART FOR A CHANGE Web site is dedicated to activist art and it's role in transforming society, from my own socially conscious paintings and drawings to the works of other like-minded Artists who possess a critical vision. "Art is not a mirror held up to reality, but a hammer with which to shape it."